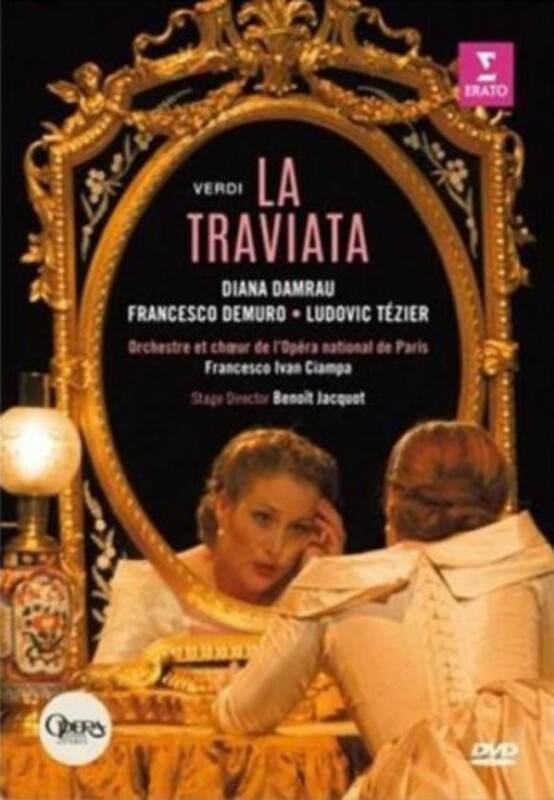 Diana Damrau’s primacy as an interpreter of Violetta Valéry in La traviata can be inferred from the names of theatres where she has performed Verdi’s most popular opera: the Metropolitan, New York; La Scala, Milan; London’s Royal Opera House; the Bavarian State Opera in Munich and the Zurich Opera. Paris’s Opéra Bastille joined that list of leading houses in June 2014, when the German soprano appeared in a new production by the film director Benoît Jacquot. Conducted by Francesco Ivan Ciampa, it is presented on this DVD release from Warner Classics, which joins a DVD of Verdi’s 'Rigoletto', with Damrau as Gilda, recorded in Dresden and released in 2010, and the recent CD release of the soprano’s spine-tingling interpretation of Donizetti’s 'Lucia di Lammermoor', recorded live in Munich. Jacquot’s production, praised for its beauty, elegance and intelligence by the French newspaper Les Echos, is set firmly in the 19th century. It takes inspiration from the paintings of Manet and features sumptuous 19th century costumes and striking decor, such as a monumental canopy bed in Act I and a huge tree and a giant staircase for Act II. Languages: Sung in Italian, with subtitles in English, French, German, Spanish and Italian.